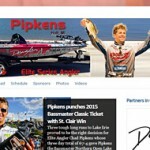 If you’re a tournament angler at all serious about your success a well-designed website can work for you 24/7, 365 days a years to promote and attract more sponsors! Solostream WordPress Themes make your website Great! Angler Hosting uses Paypal for safe and secure online payments. Your payment data is protected by their trusted PCI-compliant standards. You do not need a Paypal account.